I met Diego in January 2011. He arranged for me to pick my very first cherries on one of the coffee farms that sells to his café. I stayed up late enamored by the stars, then got up early to pile bags of coffee high on a Willy and send them into town for sale. Unbeknownst to me or Diego, thus began my relationship with coffee growing. Diego’s the real deal Juan Valdez: thick moustache, dark hair under the sombrero aguadeño, carriel crossing the chest, poncho slung over the shoulder. “Coffee with the scent of a woman” is stamped over an image of Angelina Jolie licking her luscious lips on the side of the coffee machine. How could you not want a sip of that? 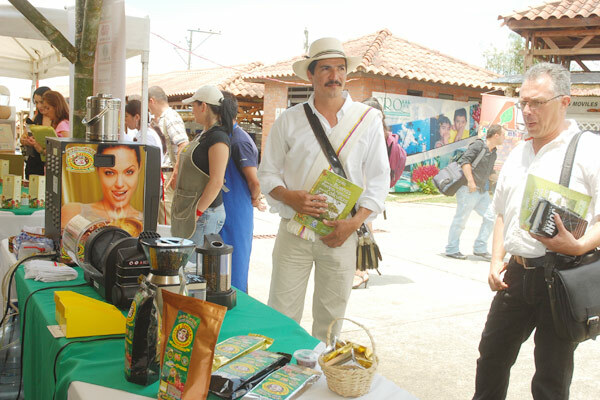 That slogan comes from Colombia’s treasured 1990s soap opera “Café con aroma de mujer” filmed in the same town.